"Capture" the image projected on the screen along with all of the notes and comments written on the screen into a single file on you computer! The new C-20 series of PLUS CaptureBoards offer industry leading features for saving and sharing the notes from your meetings. Network and Smartphone integration! The thickness of body has reduced the thickness of 40% compared old one. The shape and performance have improved and the gap between panel and wall is narrowed. 2 Writing Panels. 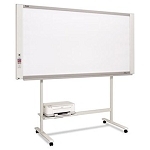 Slim Profile 3 inches slimmer than previous models the lighter M-18 is easily mounted on a wall and takes up less space in your meeting room or office. Faster Scanning Time The M-18S scans in a mere 15 seconds, an improvement of 8 seconds over the previous model. Smooth Hand-Scrolling The surface of the M-18 is easy to move when using just your hand. The scrolling force needed has been reduced to 7 oz (0.2kg). Plug and play No need to install software. Both PC and Mac compatible. Eco-friendly, Low Power Consumption The M-18 uses LED light system for low power consumption. No lamp replacement is necessary. Power consumption has been reduced to 12W/3W [Operation/Standby] Magnet Attachable Magnets can be attached to the board surface.